There's not much that's more Western in a wedding than riding into the Horse Barn at Wyoming Hereford Ranch for a reception. It's unique to have such a large barn where the bride and groom can be carted into to their reception venue and stop a few steps from the head table. It's quite a spectacle for the guests too, who are lined up on either side as the horse is guided through. Talk about a grand entrance! This photo of the couple on the white carriage shows how much fun they are having, as the driver jokes around with them. 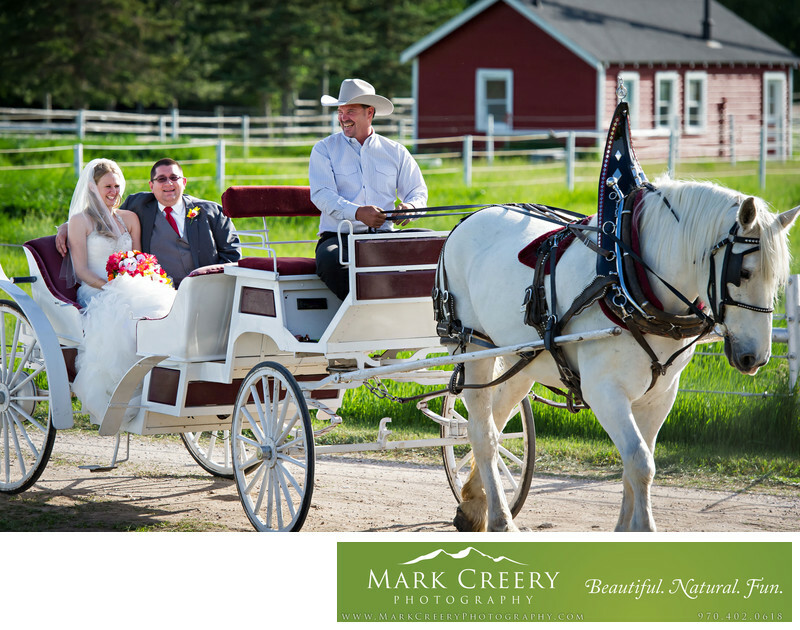 They started their carriage ride at the entrance to the ranch, and rode down their tree-lined driveway and past their many barns until they reached their destination.